O link para acessar esta página ou o endereço de e-mail digitado está incorreto Esqueceu a senha? Reservar a taxa de cartão Visa Premium com qualquer um dos Cartões Visa Luxo seguintes: Visa Signature, Visa Infinite ou seleto Visa Platinum e Visa Gold e receber estes benefícios exclusivos adicionais. Em alguns casos conseguimos encontrar quartos disponíveis. Please entre em contato conosco for assistance. Enviar solicitação de disponibilidade with your requested dates to the Villa Franca. The Classic Rooms have been designed to harness natural light. 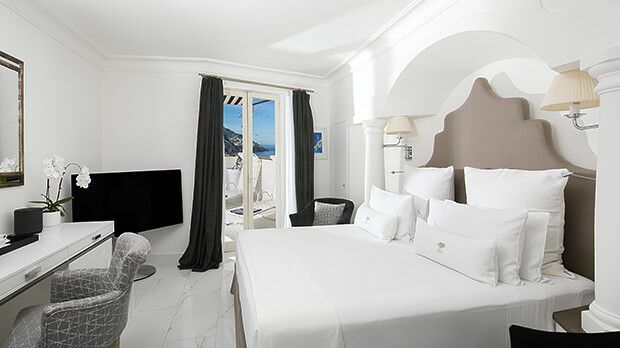 After a wonderful night?s sleep in your king-size bed, enjoy your balcony with beautiful views of Positano. Luxury meets convenience in the Italian marble bathroom, which includes bathtub and shower. Other features include satellite LED TV, desk, free Wi-Fi, air-conditioning, safe, comfort kit, minibar, and docking station. The Superior Rooms are made for romance. Spend your evenings on the balcony, watching dusk fall over the pastel-colored houses of Positano. Expect sleek, understated furniture, a king-size bed and sumptuous textiles. The Italian marble bathroom is fitted with a bathtub or spacious shower. All our rooms come with satellite LED TV, desk, free Wi-Fi, air-conditioning, safe, comfort kit, minibar and docking station. 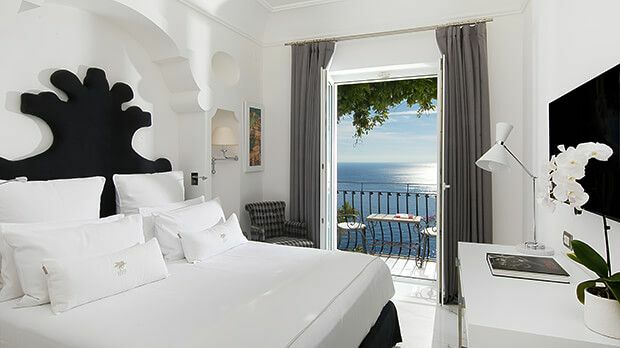 The decadent Deluxe Room features a balcony with breathtaking views of postcard-perfect Positano and the sparkling sea. Indoors, stylish furniture includes a king-size bed, and the Italian marble bathroom features a bathtub or spacious shower. Thoughtful details, such as a Nespresso machine and an iPad, make a stay here extra special. All rooms come with satellite LED TV, desk, free Wi-Fi, air-conditioning, electric safe, comfort kit, minibar and docking station. The HVF Suite blends luxury and laid-back design. Each opens onto a balcony or private terrace with stunning sea views. The living and sleeping areas feature timeless furnishings and a king-size bed, while the Italian marble bathroom includes both bathtub and shower. Along with an iPad, a B&O wireless speaker and a Nespresso machine, expect all our standard features. These include satellite LED TV, desk, free Wi-Fi, air-conditioning, safe, comfort kit, minibar and docking station. Enjoy peace and quiet in an intimate Studio Suite. Step out onto the balcony to see pretty Positano. Indoors, the refined furnishings include a cozy living area and a decadent king-size bed. The stylish design extends to the Italian marble bathroom, where you?ll find a bathtub or double shower. Along with an iPad, Apple TV and a B&O wireless speaker, these suites feature satellite LED TV, desk, free Wi-Fi, air-conditioning, minibar, comfort kit and docking station. 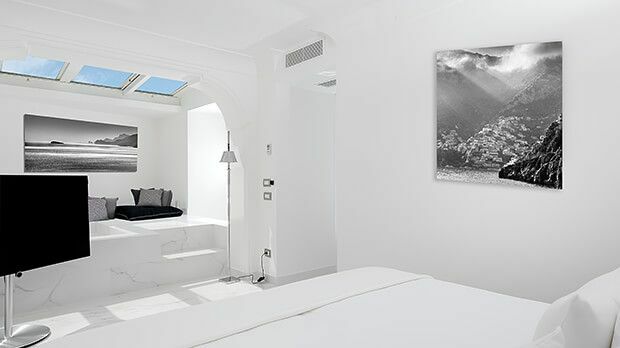 The Terrace Suites are perfect for sun worshippers, offering 15sqm of private outdoor space. Relax on a chaise lounge as you take in panoramic views of the entire bay. Indoors, the chic, contemporary furniture includes a king-size bed, and the Italian marble bathroom offers views of the village. Enjoy access to Apple TV, an iPad, a B&O speaker, and a Nespresso machine. Other features include an LED TV, desk, free Wi-Fi, air-conditioning, safe, minibar and docking station. This suite in the villa annex is large enough to feel like a home from home. Its private terrace, complete with chaise lounges, overlooks the bright blue ocean. The generous indoor space has a living area as well as a magnificent king-size bed, and the Italian marble and stone bathroom houses a bathtub or shower cabin. You?ll also have access to Apple TV and an iPad, a B&O wireless speaker, and a Nespresso machine. Other features include satellite LED TV, desk, free Wi-Fi, air-conditioning, safe, minibar, comfort kit and docking station. 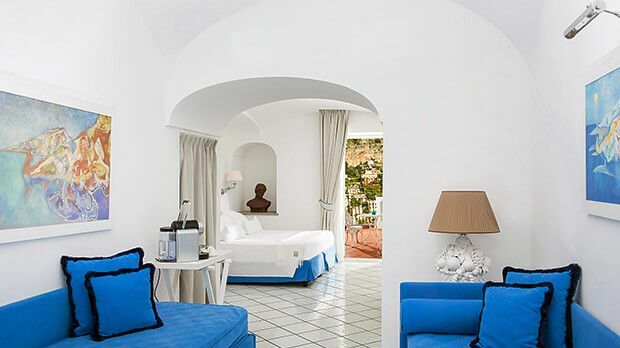 The HVF Master Room truly embody the Hotel Villa Franca spirit. These ultra-luxe rooms, tucked away in the villa annex, come with a king-size bed and a separate living area. Relax on a sun lounger on your private terrace, with gorgeous sea views as your backdrop. Your Italian marble and stone bathroom will include a bathtub, a double washbasin and a shower cabin. Enjoy access to Apple TV as well as an iPad, a B&O wireless speaker, and a Nespresso machine. Expect all our standard features too, such as a satellite LED TV, desk, free Wi-Fi, air-conditioning, safe, comfort kit, minibar and docking station. Nossa equipe de reservas sempre tem prazer em ajudá-lo - sete dias por semana, 24 horas por dia. © Copyright 1996-2019 Visa. Todos os direitos reservados.